I'm very active at work. I work in retail, and my store is huge. My job is to walk guests to what they need. I walk all day long. I only work 6 hrs so I get a short break in the middle of my day. Not long enough for a full meal, so I usually have a bar of some sort and a piece of fruit and eat something else more substantial when I get home. I've started eating Balance Bar BARE for my noon snack. It really does give me the energy to get through the rest of the day! In fact, I was going to eat one for a snack last night and realized it wouldn't be that great of an idea because the last thing I needed at 11:30pm was a nutrition/energy bar! My favorite was the Sweet & Salty Chocolate Almond, although all 3 flavors were yummy! It was a very full bar. No skimping with quantity or quality. I felt very satisfied when I finished eating my Bar! I'm finding that Balance Bar is really a good tasting, satisfying product to go to as a snack and for the extra bit of energy I need for my day! "BARE Balance bars are sweetened with all natural organic agave and brown rice syrup. They contain 15 grams of protein, up to 5 grams of fiber and up to 7 grams of whole grains. They have 200 calories, 19 vitamins and minerals, and are an excellent source of antioxidants. Each 1.76 oz. single serve BARE bar adheres to Balance Bar’s proven healthy 40/30/30 nutritional model (40% of calories come from healthy carbohydrates, 30% from quality protein, and 30% from dietary fat) to help stabilize blood sugar levels, satisfy hunger and provide lasting energy." · fifteen BARE Balance bars in three delicious flavors – Sweet & Salty Peanut Butter; Sweet & Salty Chocolate Almond; and Blueberry Acai. The items are wrapped together for an extra-special presentation and neatly boxed for free ground shipping. 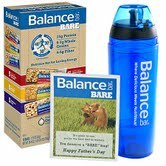 The very affordable Balance Bar BARE Father’s Day Gift Set is only available online at www.shopBalance.com while supplies last. The introductory price of $17.84 – valued at $27.00 – includes ground shipping and handling within the U.S. (Tax where applicable is not included.) To qualify for free ground shipping, orders must be placed by June 11, 2012. I would love to try any with peanut butter!! The cookie dough bar looks delicious! Love the sound of all of them! You really know how to write a review gal, I always love coming to your reviews and giveaways! I would try the Carbwell bar. Great write up and giveaway!! the nimble orange and cream bars sound great too! Balance Nimble Peanut Butter Bar would be great! I'd love to try the cookie dough flavored bars! I want to try the gold bar caramel! I want to try the gold bar with caramel! I would love to try the balance bar gold Chocolate Mint cookie crunch. Sound GREAT!